Got some useful info from Iceland today about phalaropes. We could get them in the UK in the autumn, but we'd rather see them in sum. plum if we can. In the meantime here's a photo of what we think Wader Quest is all about (other than raising money to help the spoonies of course). This was a bunch of children with whom Elis and I worked in Brazil. 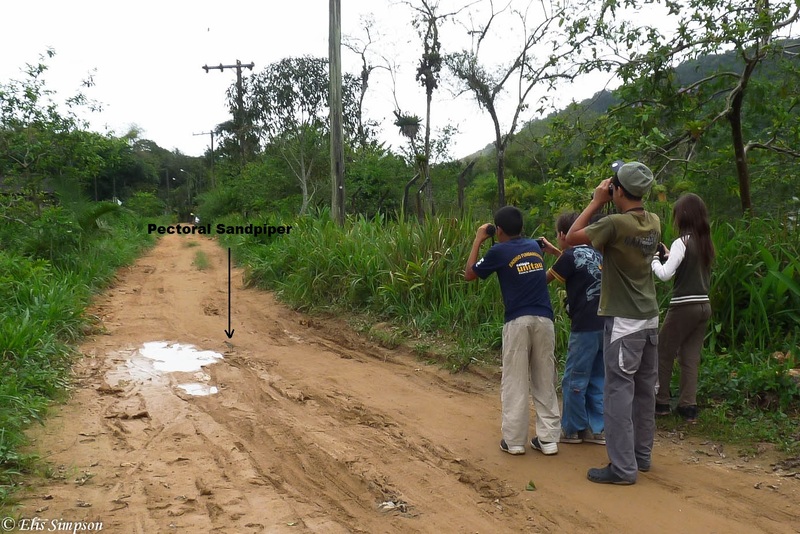 We used to take them for weekly walks in the forest and on one occasion nothing less than a Pectoral Sandpiper landed in front of us on the path, magic moments. These kids had never seen anything like it in their neighbourhood before. Gave us a great opportunity to tell them about migration. Their wide eyed amazement that such a small bird was undergoing such an immense journey was priceless. It is this that we hope to capture with people we speak to around the world, get them to realize that these little brown birds running around on the sand are nothing short of living, breathing, miracles!